Your guide to what’s happening in Brixton this week. Wednesday August 18: South London Cares first birthday pub quiz. The Brixton-based charity that supports the elderly is putting on a pub quiz, hosted by comedian Tom Webb. 7 pm to 10.30 pm at Dogstar Brixton. Tickets cost £5 in advance and £7 on the door. 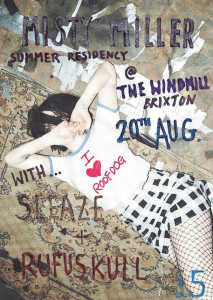 Thursday August 20: Misty Miller plays at Windmill Brixton. Local singer-songwriter Misty Miller plays her second residency gig at Windmill Brixton, along with Sleaze and Rufuskull. Tickets £5 in advance, £6 on the door. Friday August 21: FUR at Upstairs at the Ritzy. Instrumental British hip-hop up the stairs at our local cinema, accompanied by solo multi-instrumentalist Benjin. Tickets £5. 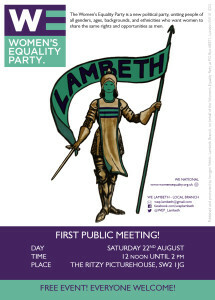 Saturday August 22: Women’s Equality Party Lambeth launch event. WEP will introduce the people running the branch, open elections for positions to come and explain what they’re hoping to achieve in the near future. Ritzy cinema, 12 p.m to 2 p.m, free. Sunday August 23: Brixton Soup Kitchen is launching its community garden, donated by Citi Bank UK, at the charity’s HQ, 297 – 299 Coldharbour Lane, Brixton. There will be food and drink on sale and all proceeds will go towards the Soup Kitchen. They are currently raising money for a van, which will aid the day-to-day operational needs of its outreach service.